I was watching the Holy Spirit Youth Dancers at the 2014 Greek Fest when I had a thought: the colorful, traditional costumes worn by the dancers and the music to which they were dancing was an obvious celebration of Greek culture and art. 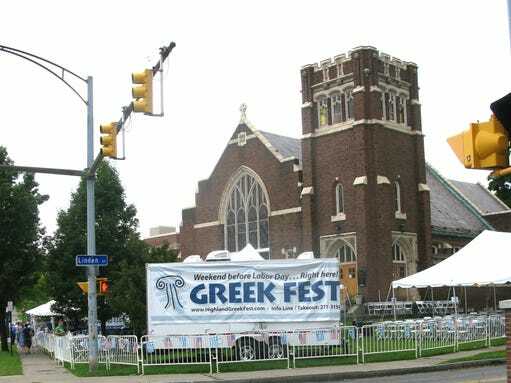 This popular Greek festival has been organized and operated for a number of years by members and volunteers of the Greek Orthodox Church of the Holy Spirit on South Avenue. So, we have a synergistic combination of religion and Greek national pride, all in one event. Let's look at the Festival and its connection to Greek culture. It took place from Thursday, August 21st through Sunday, August 24th and consisted of music and dance, an incredible selection of Greek foods, a raffle and the chance to shop at a Greek boutique, grocery store and coffee shop. Lots of people enjoyed the dinners such as Mousaka (layers of eggplant and potatoes), Pastisio (baked pasta and meat sauce), Loukanikos (delicious Greek sausages), Souvlaki (marinated and grilled chicken or pork over rice) and Gyro (seasoned and grilled lamb or beef over potatoes). There were also appetizers (like deep fried squid) and side dishes (like Spanakopita) too numerous to mention. Now, let's look at the religious connection. The Orthodox Church has had an uninterrupted and basically unchanged existence since being founded by the apostles of Jesus Christ. Even though there are Greek, Russian, Antiochian, Serbian, etc. Churches, these divisions do not affect their theological approach. You do not have to be Greek or Russian to belong to the Greek or Russian Church. The designation refers to what the Orthodox Church calls the parish (or jurisdiction). Each of these is under the leadership of their own bishop. If you wish more information on this topic, please contact Father Patrick Cowles, Holy Spirit Greek Orthodox Church, 835 South Avenue, Rochester, NY 14620.